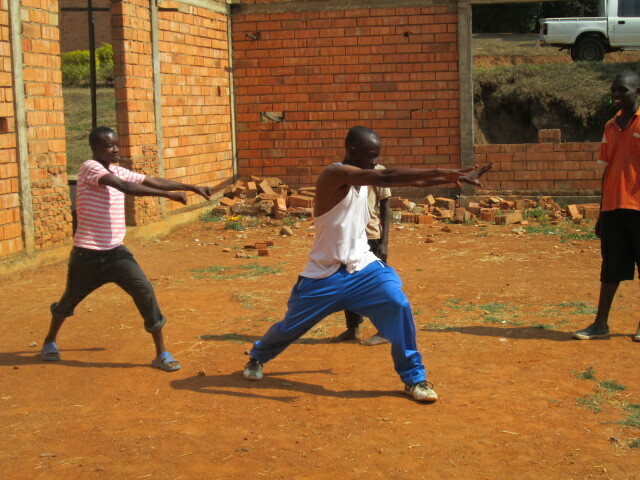 In the last few days I have had some of the most powerful moments of my entire life while teaching the choreography to the young people that I am working with here in Rwanda. 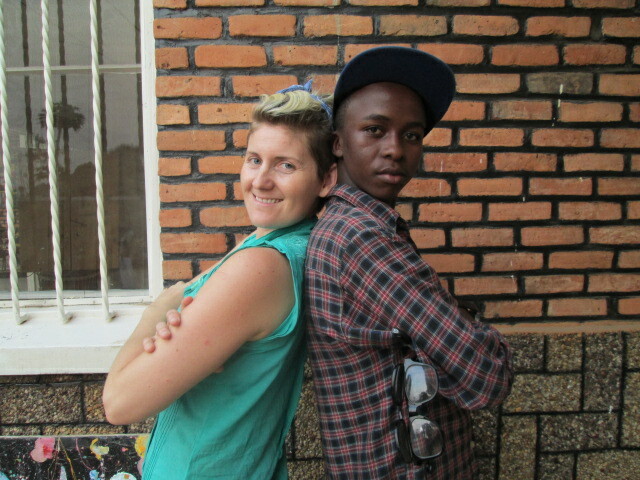 The other day it was with Gilbert’s group of students, today it was a local boys orphanage that I found through a connection I made while at the Sauna and before that the large group that joined me at Inema Art Centre. Gilbert’s group of students are so sweet and so willing to work hard. I can see that because a lot of them do not go to school they really have almost nothing in their lives that provides some kind of momentum or chance to do or be a part of something. All of the boys were new to me this day ( until Mohammed showed up later on) and yet they were there with the Thriller dance sheets in hand ready to learn and be a part of this event that I am hosting for them. They just handed themselves over to what I am doing and are thrilled (pun intended!) to be here, learning and practicing. I don’t think they really fully understand what they are a part of just yet but it will become more evident as we move through this adventure together. It became more clear to me what I am doing when they started to ask me questions after practice and it was revealed that I could possibly find help for them to go to school and that the money we raise from the dance event is for them. One boy in particular really made it hit home the potential that lies within what I am doing and also the potential for real pain. The look on his face as he spoke about wanting to go to school, he is wanting it so badly and it is something that I just totally took for granted in my life. 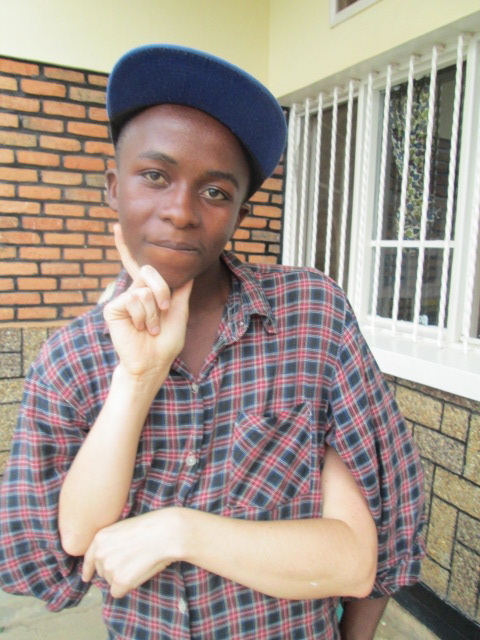 Here he is this beautiful, strong, gentle, sweet young man full of potential and he just has no choice to fulfill it. I realized that I could help make a connection for him that could change his life forever by using my natural ability as a connector of people. I also felt a wave of the magnitude of what I was stirring up within his heart. His face was so full of hope and I felt myself flinch at the idea that I had planted that seed and it is my responsibility to now be very clear about what I feel capable of doing. I never promise that anything will happen but I do promise to do what I can to help. It is time for me to step up and step out once again to a new place within myself that is VERY capable of making this happen. I watched as my mind said “Its only $105, just put it on your Visa, but then where does it stop. 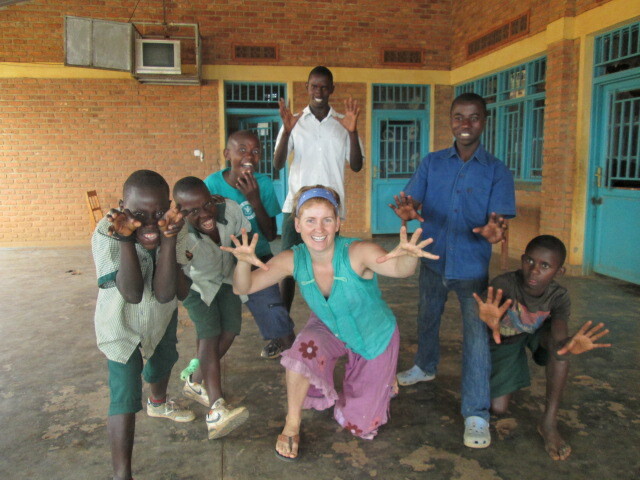 There were 2 Orphans and 3 children who were not in school dancing with me that day alone. I see hundred of kids here and adults who need help. It is not my job to help them in all ways, all the time. I feel my biggest gift is to be here, dancing, and putting energy into finding others to help me help them to help themselves. I can’t do it all, no one can, it takes a Village and I am but one member of that Village. That is what the proceeds from this event are for. Maybe this is what the new seed that I have planted of me starting my own NGO is going to fuel. There is so much potential here for so many people all over the world the be a part of something I have created in the name of healing myself and it is further proof to me that we are all connected. Watching them dance the first part of the choreography while I video taped it for them nearly brought me to tears. They were working so hard and did so well. Watching a seed that I have planted come to life was really moving. It was a new experience for me and once again it was Michael Jackson who brought me to this moment. Some of it was knowing that the kids were literally dancing for themselves, and also a new element of my life coming into fruition, which is dance and art being something that I actually DO! It is what i am doing here and that really became clear. I am living life the way I want, no more doing things for the money or the “should’s”, here I am actually doing what I am meant to do and doing it for nothing in return (financially). Sometimes when I am actually in things it takes a while for the reality of the situation to hit me, this was one of those moments. 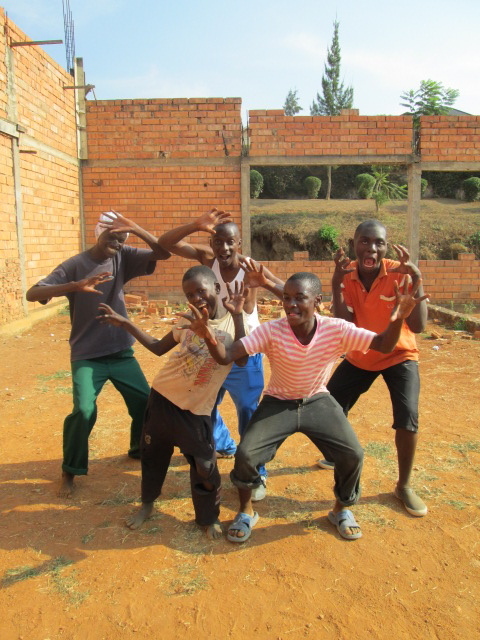 Today at the L’enfants Presbeterian de Jeune Orphanage in Kicukiro I was welcomed openly and with amazing energy to dance with and teach the young boys and men who live here. I met a young man from Japan named Ryo at Le Sanitas about a month or so ago and asked him if he would be interested in learning to dance to Thriller – his face lit up and of course he said yes! 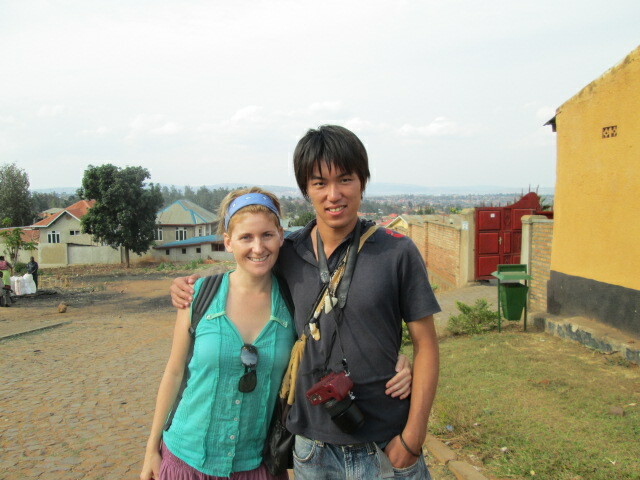 He then told me he was here volunteering for 2 years at an orphanage and the kids would love it too. It took a while but it worked out for me to come today and be with them. I am not sure if they can attend the event as it takes place at 11pm this year but I have committed to coming once a week to dance with them and teach them the choreography as well. We may even set up a separate event there for them if they really can’t attend but want to participate. The way their eyes opened wide and their smiles got huge as we shared our dance moves with each other was such an amazing gift to be a part of. Man can these kids dance! As I looked at these beautiful faces the reality that they have no parents hit me as well and is something else that most of us take for granted. I realized again, how much of an impact it was having just being there with them giving them my time, energy, attention, my spirit and a few hugs. 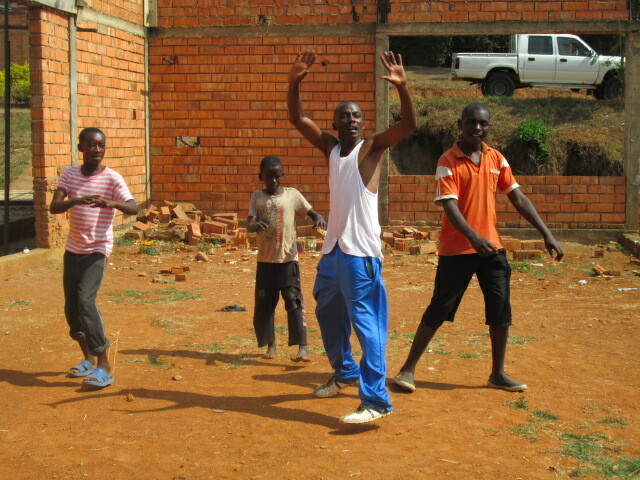 One little man would give me the biggest, hardest High 5’s every time we finished a section of the dance – it was great! I can see how much this day brightened there lives as well as mine. My commitment to my own healing is why I am here doing this, it is proof that when we heal ourselves we heal others. 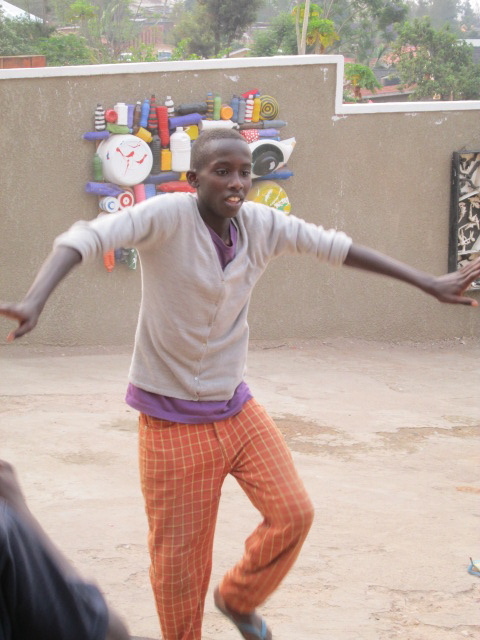 What I am witnessing in myself is a strengthening of my voice, which to me symbolizes my ever increasing confidence by stepping into this role as a dance teacher – a dream of mine in action. It is a powerful feeling to have my dreams come to reality. 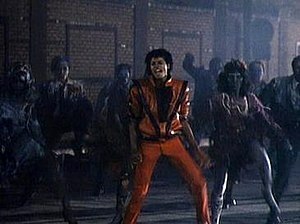 Thriller feels like a launching pad into my creative endevors coming to life. Yay! Last Thursday I arrived at Inema Art Center for the first dance practice and had 20+ kids and adults learning with me within a few minuets. 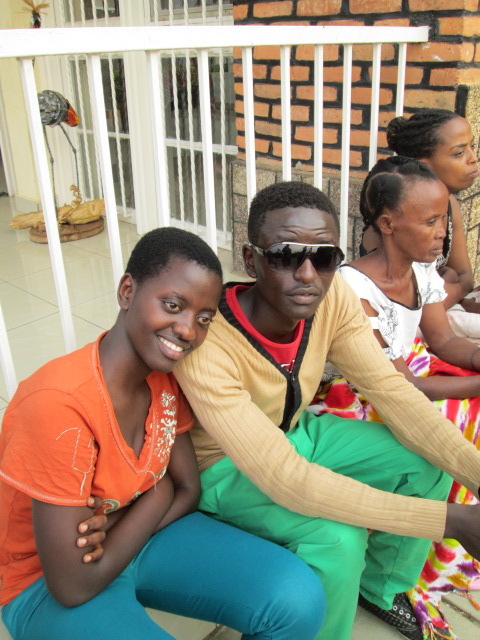 When I arrived I realized I had an expectation that Emmanuel would get the kids together for me or something, but right away I knew that was not happening and I needed to somehow get the kids, who speak mostly Kinyarwanda, to understand why I was there and what it was for. I made the one connection I needed with a young girl sitting on a ledge and soon I had at least 12 kids. One young man in particular, Christian, was really into it. He was looked like MJ with his “Fraiche” sunglasses on and had great dance moves to match! It was his sister I had spoken to and he had come to watch her today with his friend who was soon to be my DJ! Soon I had them understanding what a zombie was and we began the first step which is called “Zombie March!” Within a few minuets more kids and their dance teacher had shown up and joined in either watching or dancing. People always gather to watch from afar (Balconies, roads, gateways, windows) and with each of these three groups there were at least 10 people watching curiously and are always welcomed to join in. There was one keen spirit in this group as well who, as soon as we were finished, would turn to me and say “Again!” These kids learned the whole first section and most of the middle in about 35 mins and when I say “learned” I mean they could really dance it, it was very impressive. The momentum for this event and for my life is picking up so much speed that I literally cannot sleep at night because I am oozing with creativity and passion for what is unfolding. I have had glimpses of this energy in my life but never at this pace and this consistency. I knew that Thriller was going to open things up but I could never have imagined what has become possible in my mind because of this commitment. I love that I am here, doing this and just owing who I am and standing up for what I feel I am meant to do. My life makes more sense everyday! I changed my mind and it changed my life! Next step: Figure out how to start bringing in some money for this event!